I was flipping through the latest edition of "Women in Optometry" the other day when I saw a photograph that looked quite familiar to me! It was none other than probably one of the newest TLC Tysons Corner Affiliates, Dr. Joanna Wen. If it weren't for the fact that she had just visited the Center the week prior, I would totally have glossed over this mention, but having just met her, this article totally caught my attention. 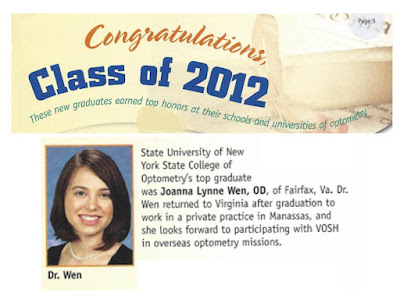 Dr. Wen was highlighted for her academic accomplishments while at SUNY College of Optometry. She was named Valedictorian of her optometry school class. According to Vision Monday, her school said that "Wen achieved excellence in academic and clinical performance, ranking the highest GPA in her class. As a volunteer, she provided patient care to the under-served. She exemplifies the best and brightest SUNY has to offer."